Raspberry muffins are not raspberry cupcakes. One of the things I love about a muffin is that it has a lot less sugar than a cupcake. That is, it should. I've seen recipes with sugar levels nearing that of cupcakes. I've made this recipe with even less sugar than indicated here, but I must admit it does alter the texture a bit. So I'm writing the recipe here with the maximum amount of sugar, which amounts to under 3 teaspoons per muffin without the glaze. If you've read my Sugar - Toxin or Treat? post, you know I limit myself to 6 teaspoons of sugar per day. So I could have two of these without the glaze. The glaze brings it up to 4.5 teaspoons per muffin. The texture is wonderful. Of course, the key to proper texture of any muffin is not overmixing, not developing the gluten in the batter. So I've included some tips in the directions. 2 In 2- or 4-cup glass measure, melt the butter in the microwave; cool slightly. In 1-cup glass measure, stir together fresh lemon juice and milk; set aside to thicken a bit. 3 In large bowl, whisk together flour, sugar, baking powder, baking soda, salt and mace or nutmeg. Take out 2 tablespoons of the flour mixture to coat the berries before adding them to the batter. 4 Add soured milk to melted butter, and whisk in eggs, lemon zest and vanilla extract. Add thoroughly whisked wet mixture to thoroughly whisked dry mixture. Stir as little as possible, just until dry ingredients are moistened. Using a silicone spatula, gently fold in the berries. 5 Scoop the batter from the edge of the bowl so as not to further mix the batter and evenly fill twelve muffin cups just about to the top. Bake for about 20 to 25 minutes or until lightly browned and a toothpick inserted in a center muffin comes out clean. Note: I used frozen raspberries and baked the muffins for 25 minutes. With fresh berries, they would take less time. 6 Whisk powdered sugar to get most of the lumps out, then whisk in lemon juice. Drizzle over slightly cooled, but still warm, muffins. If you like the glaze to be visible, cool the muffins more before glazing. Serve warm or room temperature. Sully, I think I just hit on the problem. If you have only ever had a muffin that's been sitting in a bakery case all day, you have not had a muffin as it was meant to be. Even an excellent (if I do say so myself), un-dry muffin such as this one will not be at its best later in the day. You need to try one that's been out of the oven about 15 minutes to an hour - you'll be a convert! That's why I usually just make 6 muffins at a time. Less sugar is good. I find many muffin recipes are overly sweetened. These berry muffins look very fresh and inviting! Thank you, Angie. And, of course, they could be "healthed up" a bit with a little of the flour replaced by some whole grains. Oh dear me, Jean, I adore anything with raspberries! Your muffins look so pretty and especially on that lovely plate. Yes please, I'd love one with my cup of tea right now! I made raspberry jam last weekend, but that's probably way too much sugar for you. Thank you, Kitty! And since you already have your homemade raspberry jam ready, don't miss my post next Thursday! Lemon glaze, oh YUM! It would also go quite nicely on my all-time favourite muffin, blueberry. Oh my, looks tasty and oh so yummy :) Thank you for attending the #WednesdayAIMLinkParty. I shared your post. Cara, thank you! And that IS funny - "better branding"! Mrs Shoes, yes, by all means use blueberries instead of raspberries; it's all good! Zenda, thank you. I hope you'll let me know how they turned out for you. Thanks, Grammy Dee - much appreciated! Raspberry and lemon make a tasty combo! This is the first time that I've heard that mixing can affect texture. I used to work at my local public library when I was a teenager so I've always had a soft spot for libraries. I can spend hours looking at the cute little free libraries online! It looks delicious...No,VERY VERY DELICIOUS!!!Xoxo,Maristella. What a great combo of flavors, Jean! You know me....anything that adds lemon I like. Alas at this moment in time I'm curbing my gluten and sugar intake so I have to refrain from making these for me....but perhaps my sweet-toothed hubby would enjoy a treat! Thanks, Sue! Though gluten doesn't seem to bother me, I always feel better when I limit my sugar intake to not more than 6 teaspoons per day. Hope your "curbing" works well for you. Oh Jean, these look wonderful! Thank you for the tip on coating the raspberries with a little flour. That would go a long ways to not having them make little soggy spots in my muffins! Awesome! I don't think I had ever heard this. Thank you. Raspberry and lemon are my most favorite fruit combination so these are going to be greatly enjoyed - as soon as I find some nice raspberries. These look awfully good! I should be able to have something like this in another week and I have to tell you, I'm getting a bit itchy to bake again! Although I did the stupidest thing. I ordered my long wanted, first Madeleine pan and it arrived shortly before my surgery. I showed it off to Rick and I promptly lost it. I've searched everywhere, even under the couch (because when it doesn't show up in all the obvious places, you go for the really desperate.) I gave up today and ordered a new one. It wasn't that expensive and of course now I'll find the other someplace when I least expect it! So, hopefully someday, if you haven't already, I'll see a Madeleine recipe here. And by the way, that tea is fabulous! Again, thank you! Dear Lily, I hope you find some raspberries soon! Let me know how these turn out for you. I'm going to try to stay out of the kitchen this weekend and enjoy other things! Hugs. Jeanie, I have done things like that before - that pan will definitely show up. But, no worries, you can just make twice as many madeleines at once! And, yes, I have posted my recipe. http://www.delightfulrepast.com/2015/07/madeleines-classic-french-teacakes.html Though I make mine in a different pan. Have fun! They look wonderful, Jean. I've always preferred muffins to cupcakes. I like blueberry and raspberry. Fruit is always my favorite. I'll be making these. Thanks, Judy. And I always choose a fruit dessert or treat, too. Muffins can be such a tasty treat . Your recipe looks wonderful. I am always interested in cutting down the amount of sugar in my baking. Wow! Jean, these are beautiful and look so yummy!!! I have simple and classic tastes so I think my favourite muffins are nature with dark chocolate chips. Close to my house there is an excellent bakery which makes it... they disappear very quickly (a real success their muffins). I also like banana muffins and I can't wait to discover your gorgeous strawberry muffins. These muffins are simply mouth-watering! Thanks a bunch for the amazing recipe, Jean! I totally agree, Jean, there is a big difference between cupcake and a muffin! 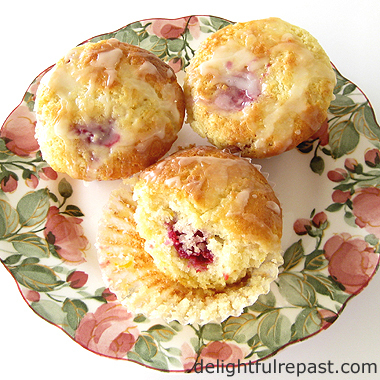 Your Raspberry Muffins look delicious and I love the lemon glaze. They are perfect for tea time. Pinning and sharing. Thank you so much for your support of Hearth and Soul. Gerlinde, thank you. And I'm glad to find someone else interested in cutting back on sugar in recipes. TRT, thank you. I'm glad I don't have a good bakery *too* close to my house - I eat fewer floury things if I have to make them myself! :D I'm not sure, but I think I've posted my banana muffins. Agness, thank you. I think they'd make a great treat after a run. I'm writing down this awesome and for sure delightful recipe, while I'm waiting for our raspberries get ripe ... it's quite cold, yet, and it's raining quite a lot, so they're growing more and more, that's why I think this year we're going to have rather juicy fruits ! I love raspberry anything. It would be without the glaze for me as it adds too much sugar. Dany dear, I wish I had raspberries growing, but not at this time. Perhaps one day. Enjoy your lovely rain! I'm with you, Magali - raspberry anything and no glaze for me! I'm really quite careful about my sugar intake. I love the raspberry lemon combination. Looks delicious! Thanks, Cathy. Wish I had one right now! Tony, I've not heard of Clarice Cliff, but I'll definitely look into her now - thanks for the tip! It's easy to know how much sugar I consume because I rarely eat or drink anything with sugar in it that I did not make myself. I simply divide the amount of sugar by the number of servings in the recipe, and there you have it! And I make things with less sugar and eat smaller portions. Well, thes might become my new favorite muffins but so far, my Aunt Rae's golden raisin and rosemary muffins are neck and neck with her rhubarb muffins! Thanks for this recipe, Jean, and for your hints to make tender, light muffins. Oh, David, thank you so much! It's too long since I've made rhubarb muffins. Seems like the rhubarb season gets shorter and shorter every year, and I keep missing it! I think my favorite muffin is blueberry or banana. 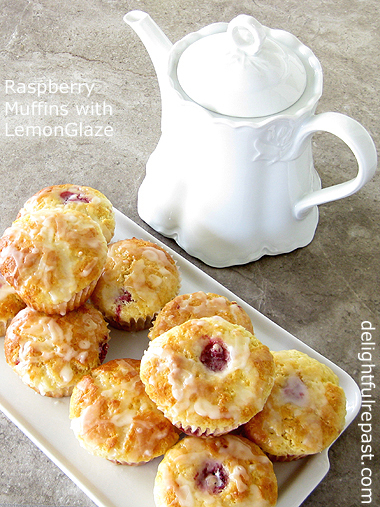 Rasberry and lemon just go together, your muffin recipe sounds delicious! Thanks for sharing and have a great weekend! Thanks, Rue! Of course, you can use blueberries in this instead of raspberries. And I love banana, too! Cecilia, thank you. I'd be having a better weekend if I still had some muffins - but I've sworn I'd stay out of the kitchen this weekend! Can I get few I need your tea to go with it, Delicious. Thank you, Swathi! Put the kettle on, I'll be right over with a tin of tea and basket of muffins! Thank you, Martha! You'll want to pick up some raspberries for next Thursday's post - my favorite use of raspberries yet! Thanks for sharing with us at the Bloggers Pits Stop your Sweet delights…… Very Informative. Much appreciated! Oh my goodness! Maybe it's just because I'm hungry right now, but these look amazing. I almost want to stay up late and make them tonight. But since I don't have raspberries or a lemon in the house, I'll have to wait until tomorrow. I'm scheming how I'm going to fit a trip to the store into my morning. Thanks, Jean! These muffins look really yummy! I would love one right now! Thanks for sharing. wow, these muffins look amazing. I hope you stop by Thursday Favorite Things on my blog since you have been featured. Bernideen, I'd like to bring over a batch and have tea in your garden with some of your lovely tea things! Bev, thank you so much! I'll hope right over there now! Miz Helen, thank you so much! I can't tell you how much I appreciate that! Hope you'll like my Raspberry Swiss Roll just as much. Made these today and they were yummy! I left off the glaze to keep the sugar down. Also used 1/2 whole wheat flour. They were great! Oh, and I only had olallieberries and blueberries on hand so I used them! Thank you, Richard! I love them with any kind of berries. I most often make them with blueberries. It's been far too long since I've had any olallieberries.